There is no limit to the connections that the internet of today can create. Japan, for example, has managed to introduce one of its most popular cartoons to the USA via the internet. He goes by the name of Domo Kun, which doesn’t sound like much, however, he is definitely a red carpet member among Japanese students. Only five percent of the student population in Japan hasn’t heard of him. So who is he? Why is he so famous? Domo Kun is an odd creature born from an egg that has a rectangular shape, a mouth that never closes, and sharp saw-like teeth. Although he sounds like some kind of monster, his name is actually the equivalent of “thank you” in the Japanese language. Domo airs on the NHK, or in english translation, the Japan Broadcasting Corporation, and was the corporations official mascot for a time. In these short episodes Domo is found living underground with a rabbit who lives in an archaic sense of style and has a particular taste in food and drink. As Domo grew in popularity, he began showing up on internet blogs, and eventually his own videos, and finally, on Halloween day of 2005 his very own website was officially up and running. 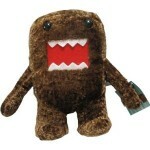 Videos, games, and all the history of Domo can be found on this site, which is called DomoNation. 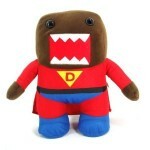 Domo Kun is a great addition to any collection of family plush toys, goes great with the kids, and has an ever-growing fanbase that you just can’t afford not to be a part of. Domo is an international sensation that took Japan by the heart and is spreading to us here in the United States, an invitation that includes take home merchandise, an english manga televison series, as well as a sweet and sour experience that only Domo can bring.